Recognizing the power of high quality practice in teacher preparation, a web-based simulation called Cook School District was designed to allow teacher candidates to practice the skills necessary to connect their teaching to the learning of all children employing the framework of teacher work samples (TWS). Pilot study data comparing simulation users' abilities to analyze hypothetical teaching scenarios, interviews, and reflective writing in real work samples suggest that the simulation plays a role in helping candidates become more aware of, and able to perform, several critical skills necessary to effectively connect teacher actions to the learning of each student. Girod, M. & Girod, G.R. (2008). Simulation and the Need for Practice in Teacher Preparation. 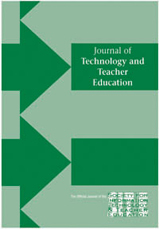 Journal of Technology and Teacher Education, 16 (3), 307-337. Waynesville, NC USA: Society for Information Technology & Teacher Education. Retrieved April 20, 2019 from https://www.learntechlib.org/primary/p/24469/. Aldrich, C. (2005). Learningbydoing. San Francisco: John Wiley& Sons. DiSessa, A. (2001). Changing minds: Computers, learning, and literacy. Cambridge, MA: The MIT Press. McConney, A, & Ayres, R. (1998). Assessing student teachers’ assessments. Journal of Teacher Education, 49(2) , 140-150. Ramsey, G. (2000). Quality matters. Revitalizing teaching: Critical times, critical choices. Report of the review of teacher education in NSW. Sydney: NSW Department of Education& Training. Shepard, L. (2005). Linking formative assessment to scaffolding. Educational Leadership, 63(3) , 66-71. Solomon, G. (1997). Of mind and media: How culture’s symbolic forms affect learning and thinking. Ph i Delta Kappan , 97(5) , 375-380.